From 13 February to 17 April 2019, YellowKorner presents “Abstraction”, an exhibition that sublimates the surrealistic universe of the photographer, Miguel Vallinas, and the sense of aestheticism of Damien Dufresne. Their subjects are displayed against black backgrounds that reinforce their enigmatic and disturbing aspects. Damien Dufresne is an unusual photographer. Art photography provides him with genuine liberty. Letting his imagination run wild, he does not seek to be provocative, but forbids himself nothing, following his instincts and creating images that have meaning for him. 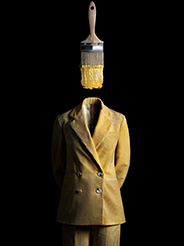 In his surrealistic pictures, Miguel Vallinas unveils characters whose heads have been replaced by inanimate objects, characters who represent our thoughts, our determination, our desires. An abstraction of the poetic real, informed by a touch of humour and mockery. The new finish presented by the art photography publisher, YellowKorner, which shows the pictures in the “Abstraction” exhibition to their best advantage, will be available from the YellowKorner catalogue from February 13. YellowKorner’s mat acrylic glass provides a high-quality anti-reflective finish particularly appropriate to brightly lit rooms. The mat finish adds “grain” to the photograph, providing additional material, asperity and vibration. All the details of the image are distinct. With no reflections, the image is even more faithful to reality than it otherwise would be. YELLOWKORNER: "Fashion Legends", a selection of iconic fashion photos.